Abogado (Lawyer), graduated with merits from Buenos Aires University (2002). LLM in Law and Economics, Universidad Torcuato Di Tella (2008). PhD candidate, Universidad de Buenos Aires (2014, expected). Visiting Scholar University of North Florida (2011). UNIDROIT Scholar. Research proyect on Securities and corporate governance in Latin America(2013). Assistant Dean for international affairs at ESEADe (2009-present day). Vice director of the LLM in Business law at ESEADE (2012 –present day). Assistant Dean for research at UCES Law school (2013- present day). Member of the research team at Universidad Austral on “Comparative Intellectual Property Law. (Essential Medicines and Compulsory Licensing). Permanent Researcher at ESEADE. Areas: Law and Economics, Intellectual Property Law, Comparative Law. Permanent Researcher at UADE Law and Economics, Legal Theory, Comparative Business Law. Professor of Economic Analysis of Intellectual Property at “Maestría de Propiedad Intelectual” de la Universidad Austral, (2011- present day). Professor of Comparative Intellectual Property Law at ESEADE (2010-present). Professor of Law and Economics at “Maestría de Derecho y Economía” de la Universidad de Buenos Aires,(2007- present day). 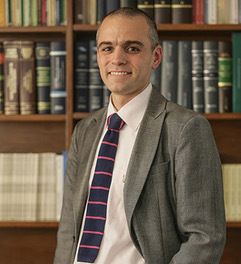 Professor of Comparative Law and Legal theory at Universidad Francisco Marroquín, Guatemala, (2012-present day). Professor of Economic Analysis of Intellectual Property and Political Economy of Judicial decision making at Universidad Francisco Marroquín, Guatemala, (2011- present day). Professor of Comparative Law and Business at Universidad Austral, (2009-2011). Professor of Law and Economics and Comparative Law at Universidad Argentina de la Empresa (2007- present day). Professor of Comparative Busines Law and Economics and International Economic Law at Universidad de Palermo, (2010- present day). Professor of International Business Law at ESEADE (2009- present day). Professor of International Economic Law at ESEADE (2009- present day). Profesor of Philosophy of Law and Theories of justie at Univesidad Francisco Marroquín 2011- Present day). Universidad Rafaél Landivar, Guatemala. “Introduction to Comaprative Law and Economics in a Globalized Economy”, (2008). Fordham University, USA. “The Latin American Perspective of Intellectual Property”, (2012). ITAM, México “Theroy of Legal transplants”, (2008). ISEADE, El Salvador “Comparative Law and Comparative public Administration”, (2012). ROMA Tre, Italy. “Comparative Law and Intellectual Property”, (2013). Universidad de Montevideo, Uruguay: “Introduction to Law and Economics”, (2011). “Patentes y Medicinas Escenciales”; Gustavo Schötz (coord.) Authors: Pablo Iannello - Joaquín Migliore - Javier F. Núñez – Gustavo Schötz; Ed. Heliasta, 2013, Buenos Aires. Análisis Económico del Derecho Societario, (Economic Analysis of Corporate Law, in press); in Sola Juan Ed., Tratado de Análisis Económico del Derecho, La Ley, en prensa.). “Sistemas jurídicos, fuentes del derecho y la economía de la adaptación de normas”, (Legal Systems sources of Law and the Economics of Norms Adaptation), in Aspectos Estratégicos del Derecho, Ed Velea, Venezuela, 2010. “Economic Analysis of Patent Law”, in Martín Krause “Análisis Económico del Derecho, Aplicación a Casos Judiciales”,– La Ley, Buenos Aires, 2006, pp. 235-248. “Pluralismo Jurídico ”, (Legal Pluralism, in press); Spector Ezequiel – Fabra Jorge Eds, Ed. UNAM 2012, en prensa. “Geneva Convention of Intermediated securties, and its implementation in Argentinean Legal System” (2013 – October, in press) Ed. La Ley. “Principles Theory and Intellectual Property Rights”, in Revista de Derecho Comercial. Ed. La Ley, February, 2013 pp 45-77. “Comparative Normative aspects of Compulsory Licensing in Essential Medicines”; Revista de Instituciones y Mercados Vol, 45 June, 2012 ,pp179-203. “Notions on the economics of corporate law in the Argentinean Legal System”, in Revista de Derecho Empresario, Universidad Austral, RADE Vol. 13 September, 2012. “Management of Intellectual Property Pricing and compensation in compulsory License Cases”. Procedings of the 7th congrees of international Business in University of North Florida 2011. “Legal Transplants and Bankruptcy Law:The Case of Cramdown Power”, at Revista de Análisis Institucional, Ed. Fundación Hayek, Buenos Aires, 2008, pp. 289-340. “Contract views. Libertarianism vs Law and Economics”, Jurisprudencia Argentina, Lexis Nexis, 2006- I-1021. “Arbitration procedure in CIADI”, Revista de Derecho Comercial y de las Obligaciones, Lexis Nexis, 2005-B-813. “An Economis Analysis of Innovation and Licences contracts”, Revista de Derecho Comercial y de las Obligaciones, Lexis Nexis, 2006-B-383. “Transaction Costs and Enviromental Regulation”, Revista de Derecho Ambiental, Lexis Nexis, N° 6 Abril/Junio 2006 pp. 95 et seq. “The Economics of Environmental Liability”, Revista de Derecho Ambiental, N° 5 Enero/Marzo 2006 pp.159 et seq. Bruce Caldwell, “Hodgson on Hayek: A Critique”, Cambridge Journal of Economics, Vol. 25 N° 4, pp. 539- 53. Geoffrey Hodgson, “Hayekian evolution reconsidered: a response to Caldwell” Cambridge Journal of Economics, Vol. 28 N° 2 pp.298 – 301. Convergence of Financial Systems, challenges for Latin America. Legal transpalnts in intellectual Property. Seminar of Law and Economics in The management of intangible Assets, Instituto de Derecho Mercantil, Guatemala. Economics of Intellectual Property, Universidad Francisco Marroquín Guatemala. Lecture on the Liability of Internet Service Providers University of North Florida. Course of Legal Aspects Management of Intangible Property, University of North Florida. Conference Economics Comparative Business Law and Globalization. Dictada en la Universidad Rafael Landivar el 2 de septiembre. Legal adaptation and Legal Transplants. Dictada en el instituto de Investigaciones jurídicas de la UNAM el 29 de mayo. Economics Analysis of Contract Law. Course sponsored by George Mason University and Hayek Foundation at Buenos Aires University. “Tensions between the libertarían thinking and the Law and Economics movement”. Asociación Argentina de Filosofía del Derecho. Honorary Member of “Instituto Argentino de Derecho Mercantil de Guatemala”, (2013). First meeting on contract farming at UNIDROIT (2013). Coloquium Liberty Fund: “Hayek vs. Keynes” (2010). Coloquium Liberty Fund: “The Rule of Law” (2008). Coloquium Liberty Fund: “The Thinking of Francisco de Vitoria” (2007). Law and Economics Congress at Universidad Torcuato Di Tella en (2006).